Since the year 2000, “north Blue, south Green” has become a commonly-used term in Taiwan to describe how the Koumintang (KMT) receives more electoral support in northern Taiwan while the Democratic Progressive Party (DPP) gains more popularity in the south. Figures 1 and 2 depict the geographic pattern of Taiwan’s presidential election outcomes of 2004 and 2008 respectively. At first glance, the north-south divide does not seem as remarkable as the east-west divide. However, the population proportion of the mountainous eastern Taiwan is only 2%, so the term “north Blue, south Green” actually applies to the western half of Taiwan. In the 2004 presidential election, the DPP not only won a landslide victory in the south but also gained certain parts of the north that finally won the election by 50.1% of the vote. By contrast, the DPP retreated to its base camp in the south and lost the 2008 presidential election with 41.6%. Why does the voting pattern in Taiwan show this north-south divide. There are two imagined national communities competing with each other in Taiwan: one Chinese and the other Taiwanese. The Chinese nationalistic discourse is built upon the shared historical experiences of immigrants from the mainland who arrived after World War II, while the common experiences of the Hohlo people form the cornerstone of the Taiwanese nation. Taiwan and mainland China were united under a single regime for a period of only four years over the past century, so, according to the Taiwanese nationalistic discourse, the people of Taiwan are not part of Chinese society. Chinese nationalists, in contrast, identify themselves and the people of mainland China as members of the same society. Thus a distinct disparity of opinion concerning independence or unification with mainland China arises when these two discourses are trying to achieve consistency on both political and social boundaries. People who identify themselves as Taiwanese are more likely to support the pro-independence DPP while people who identify themselves as Chinese or both Chinese and Taiwanese are more likely to support the pro-unification KMT. Furthermore, as national identity is characterized by ethnic references, the Hohlo people are the group who most support the DPP and most mainlanders are KMT supporters. This shows how the north-south divide of voting patterns in fact indicate is the distribution of ethnic groups. Figure 3 displays the distribution of the Hohlo population. 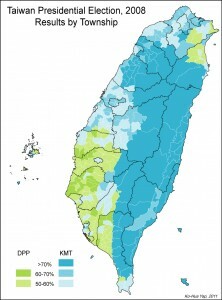 Obviously, the percentage of the Hohlo people is higher in the southwest than in northern or eastern parts of Taiwan. This map partially explains why the DPP has strongholds in the south. Moreover, I also found that similar people may foster different imagined national communities when exposed to different ethnic surroundings. Namely, the higher the percentage of Hohlo people in a locality, the more likely it is that people would self-identify as Taiwanese, no matter to which ethnic group he or she belongs. On the other hand, the more mainlanders there are in a township, the less likely people are to identify themselves as Taiwanese regardless of individual ethnicity. Therefore, people resident in southwestern Taiwan are more likely to accept Taiwanese nationalistic discourse and vote for the DPP. Ko-Hua Yap is a Research Fellow at the Center for Geographic Information Science at Academia Sinica. 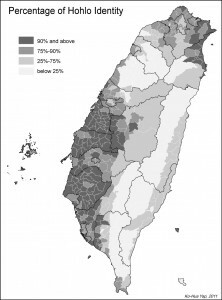 For further analysis of the geographical political divide in Taiwan, see his recent paper.